Nobu New York, the flagship restaurant of Chef Nobu Matsuhisa, has been a pioneer of Japanese cuisine since its initial opening in 1994. Bringing his modern Japanese to Tribeca, Nobu draws upon his classical training at sushi bars in Tokyo and his life abroad in Peru, Argentina, and around the world to create a whole new trend in Japanese cuisine. The resulting dishes, including Tiradito Nobu Style, Yellowtail with Jalapeno, Squid Pasta, and Black Cod with Miso, place Nobu at the fore-front of new style Japanese cookery. The restaurant has an elegant and rustic David Rockwell d�cor accented by a wooden veneer and traditional Japanese artwork. 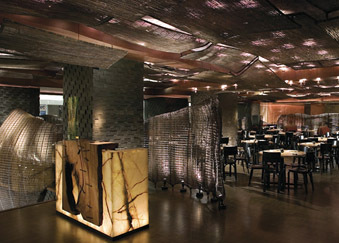 The atmosphere is famously electric, with a well off �and well known- crowd, making Nobu New York one of the hottest draws in the whole of the Big Apple.